I'm moving slowly today. I need to get moving. I have a photo shoot and I want to get there early to figure out what I want to do with the place. The people. It's 12:10 and shoot is at 1:30 and I am still in my pajamas. eep! In other news, the party on friday night was fabulous! 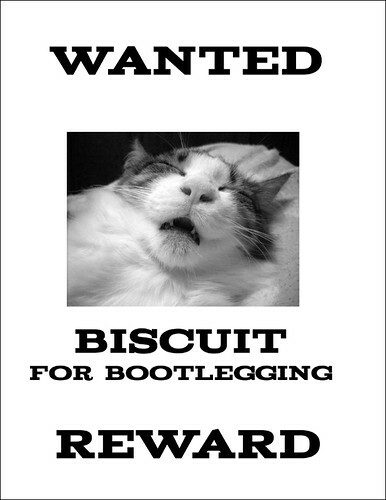 I made wanted posters for people who came and they are all in a flickr set. This is the first one I made, my test poster. I don't remember if I even wrote about the idea when I had it. Friday marked the 75th anniversary of the repeal of prohibition. I thought that seemed like a great reason to have a party and a great reason to have a *themed* party. I told people that costumes were not required, but definitely encouraged. Booze for the punch as well. I put it all in a punch bowl, had mixers on the side and let people put their own drinks together. It worked out pretty well. We have a little over a fifth of punch left, but since it was all liquor, there's no rush to drink it before it goes yucky. This is good. I don't think I'd be up to drinking a fifth of anything in the near future. Last night we went out for Steve's brother's birthday. It was Will & Terri and their friends. So we were a little out of the clique but it was still a good time. They had a limo and we went to a piano bar and then to the casino. Steve and I mostly played penny, nickel and quarter machines. Didn't win anything (wait, steve did cash out his $1.52 just because) but we didn't lose much either. So that works out well. We still have free credits to play from the players club cards we got. Ok time to get dressed and pretty and make sure all my camera stuff is packed up.